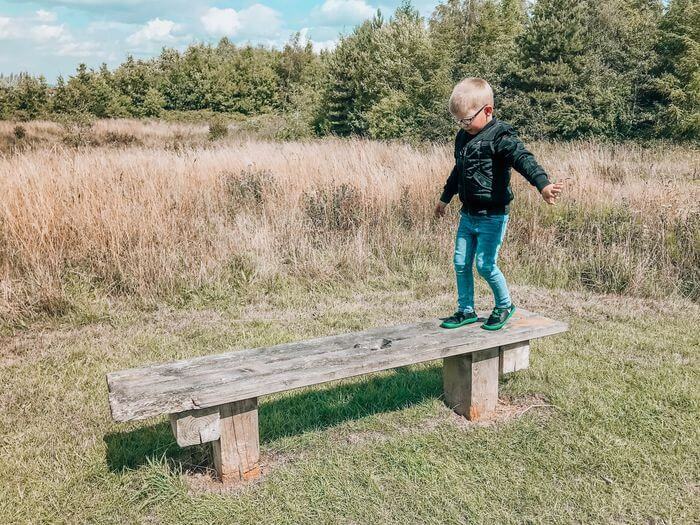 If you are looking for footwear that will promote healthy feet for your child’s development then carry on reading of our review of Vivobarefoot Primus for kids. 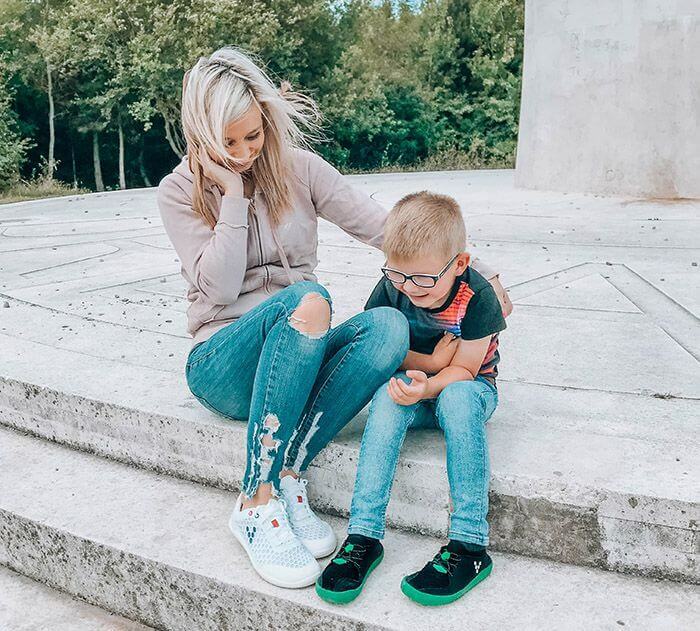 Having a very active 4-year-old son who loves to bounce around, climb everything in sight and run around for hours it’s pretty easy to see why we go through so many pairs of trainers and shoes!! We wanted a pair of shoes that were going to look after my son’s feet whilst he played and give his feet the freedom to grow naturally. We all know how hard it is to just get out the front door with kids and for them to be self-sufficient putting their own shoes on can be a big help so we wanted a pair of shoes that our son would be able to slip on himself. 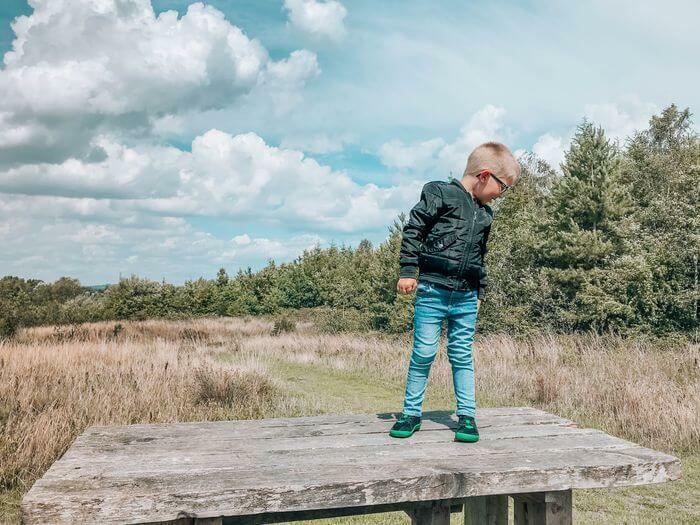 It’s also extremely important to look after kids feet whilst they are young so bearing that in mind we decided to try the Vivobarefoot Primus for kids. Vivobarefoot seemed perfect, their whole philosophy “the less we can give you the better” was exactly what I wanted for my son. Vivobarefoot wants your feet to work how they are naturally designed to and move like feet are meant too. They believe that your feet work perfectly the way they were formed. 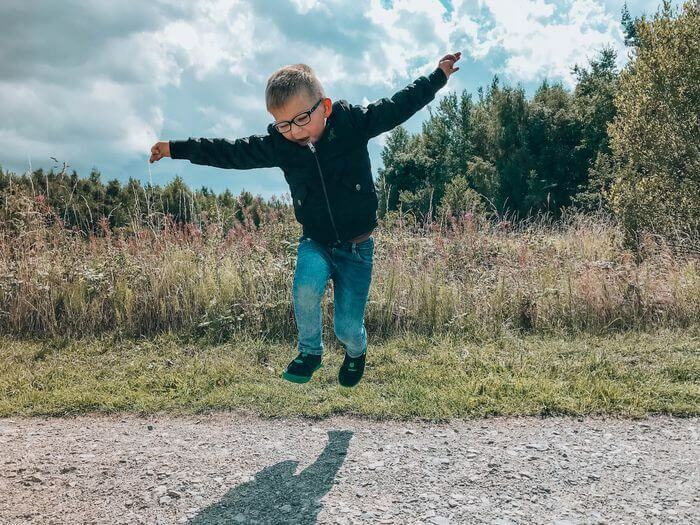 I really enjoyed reading their blog post regarding recent studies about children who are barefoot more have better motor skills. The kids performed better with balance and jumping. What I found even more fascinating was that the study also found out that kids who take their shoes off at school had better levels of concentration, behavior and performed better academically, isn’t that interesting! If you fancy having a read here is the link. 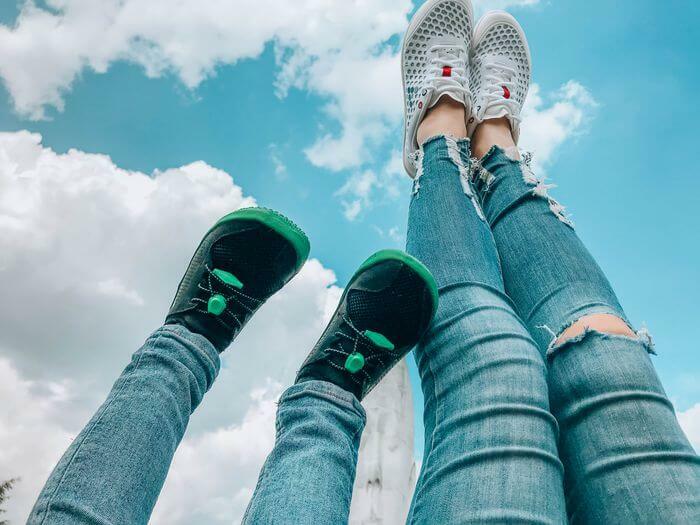 Their shoes are foot-shaped with no added support and ultra-thin soles that are still protective and puncture proof, so you get the ultimate sensory experience for your child as well as making sure their feet have plenty of room to grow. 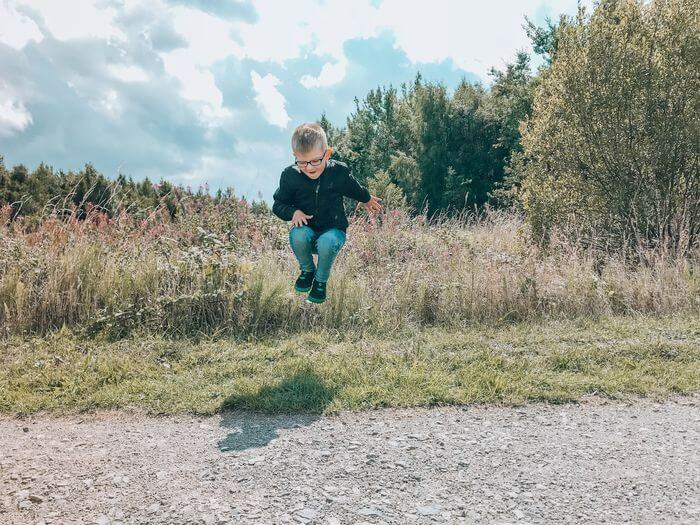 One thing I especially loved is that vivobarefoot have given the Primus a good grip, something I feel is an added bonus for kids shoes as they are always running around, slipping and falling, something my son is forever doing! The Primus will give that extra grip that is very much needed. The Primus is made from speed toggle and durable mesh upper and are built to withstand all the mischief your child gets up too. They are extremely lightweight and bendy with room for the sturdy big toe to balance and move with skill making their experiences more sensory and interesting. These shoes allow kids to feel as if they are almost barefoot. 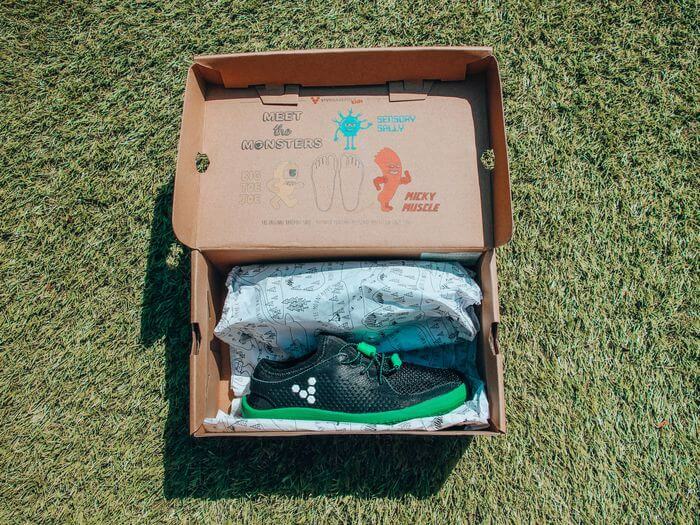 Vivobarefoot want to use 90% sustainable materials by 2020 so they are also very eco-friendly. My son’s Primus arrived quickly and was presented in a box with Vivobarefoots logo on the lid. When we opened the box there were little monster characters on the inside of the box, Sensory Sally, Micky Muscle and Big Toe Joe which my son instantly took a shine too and asked lots of questions about their names giving me the chance to inform him all about how his new shoes work. Very clever Vivo. We chose the black and green mostly because black will hide the dirt better as my son loves to get messy as most boys do! The green also made the shoes stand out. We loved the toggle-lace fastening, this makes it easier for the kids to tie their own laces. The sole, toggle and laces are green whilst the rest of the shoe is black with Vivos logo being white on the side of the shoe. One of my first thoughts was “great we will be able to fold them up on holiday” as they are very bendy and lightweight. My son was very excited about his new shoes and especially loved the green sole. Pro5- These shoes are patented with an ultra-thin puncture resistant layer that is 5x more puncture resistance then soles of the same thickness. Breathable Mesh- lightweight, breathable and comfortable they use synthetic multi-ply materials to achieve this. TPU Compound- Extremely thin, lightweight and exceedingly sturdy for the maximum underfoot sensory experience. The shoes are colourful and fun for kids, they come in 3 different colours including a lovely bright orange. The sole of the shoe is bright green along with the laces and toggle with the rest of the shoe being black. My son wore them with jeans, shorts and jogging bottoms and they went well with everything. My son absolutely loved his new shoes and when I asked him what it was he liked the most he said “I like the lace thing” meaning the clever toggle. The Primus are very light and bendy which will be great on our travels as they actually fold up. We first wore the Primus for a long walk with the family to well and truly test them out. Halfway through we asked our son if his feet were ok and he said they were great! He was running and climbing in them quite happily. We noticed he was finding it much easier climbing things in his Primus and we didn’t hear him complain once about them which he often does with other shoes. We also noticed they didn’t smell as bad as his other shoes after wearing them. I’m not joking when I say my son has the worst smelly feet I have ever smelt! Even when he was a few days old they were terrible! So, it was great that the breathable mesh was helping with the Oder. My son is a size 10 UK and they fit him perfectly. He has worn them without socks when it has been very warm and with socks when it’s been a bit chillier and both times he has been comfortable. My son had a great time wearing the Primus, he ran, climbed and bounced around for hours quite happily and now when I ask him what shoes he wants to wear he always says “Vivo please” that in itself speaks volumes. It’s nice to know that he is getting the sensory experience as if he’s not wearing shoes whilst having a great time playing. Having worn the Primus for a few weeks now they do not look worn and tatty in the slightest. I have to say I have been very impressed at how durable they have been, something that is not easy when it comes to kids shoes. The primus has extra grip on the shoes which is fantastic for energetic little boys. My son is forever falling over but we noticed he didn’t as much in his Primus. He was running up hills and down and didn’t slip once. This, in my opinion, is a great feature. Flexible and extremely bendy giving lots of free movement for little feet. 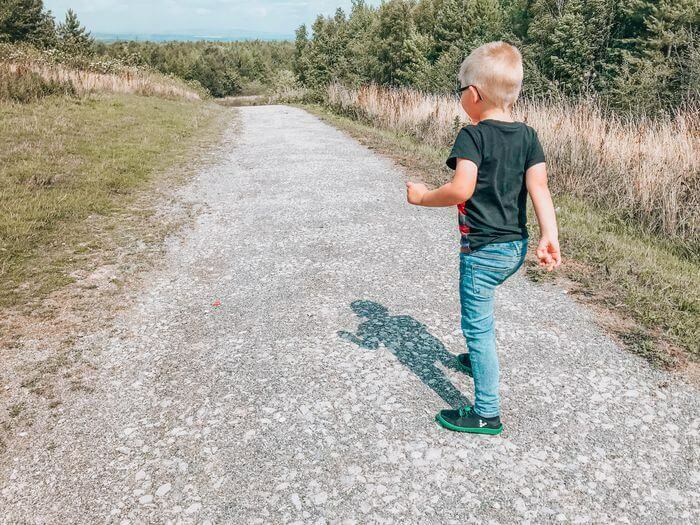 We were very impressed with the Vivobarefoot Primus Kids, they looked great and our son was very happy running and playing in them. He said he loved the colour and after a few tries he managed to get them on himself which he was very proud of. We love Vivos concept “the less we can give you the better” as this is exactly what kids need for their feet whilst they grow. Our son has been wearing them for a few weeks now and I can honestly say they haven’t worn at all and still look like new after a wipe down. We are now looking at the school shoes that Vivobarefoot have brought out as we have been that impressed with them. If you are unsure whether Vivobarefoot is right for you, don’t worry as they offer first-time buyers a 100-day trial for their shoes. Vivobarefoot believe that after 100 days if you are not converted to the barefoot experience then they will refund you your money. It’s that simple so there’s no reason not to give Vivobarefoot a try! Thanks for reading our review on the Vivobarefoot Primus for kids. I’m sure you will agree that they are a great investment for little feet to get the best possible sensory experience whilst out playing and having fun. So grab yourself a pair for your little one today – click here, you won’t regret it!